Click the photo to reveal the answers. Click again to hide the answers. The easiest birds to identify in this raft of ducks are the male Redheads, with their rusty red heads and medium gray backs and sides. There are 9 of them in the photo, though the 2 at the far left are barely visible. The three rather dark brown birds with prominent white facial "blazes" are female Greater Scaup. Female Lesser Scaup also sport a white facial blaze, but we know these are Greater and not Lesser Scaup because of their full, smoothly rounded heads. Towards the left side of the photo are three brown birds with paler faces. These are female Redheads and we know they are Redheads and not Ring-necked Ducks because of their warm brown color and full, rounded heads. There are two male Lesser Scaup in the photo. One is just behind a group of three male Redheads and this bird shows the classic Lesser Scaup peaked head shape. 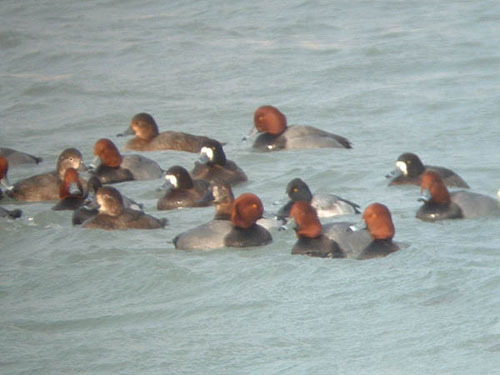 The other is sandwiched between a female and male Redhead at the left of the photo. This bird is harder to identify because it's partially hidden behind one of the Redheads but it looks smaller than the nearby Redheads and Greater Scaup, and the nail on the bill looks narrow. The hardest bird in this group to identify (and locate) is the female Canvasback. She's immediately to the left of the obvious male Lesser Scaup. Her body is partially obscured by one of the Redheads but we can still see enough of her back to tell that it's very pale. We can also see that the head and neck are rusty in color and that the bill is long, tapered, and completely dark. The long, tapered bill gives Canvasbacks their distinctive sloping head shape.